Bill O’Brien didn’t have a moment of enlightenment on Deshaun Watson. He had a series of them, and the first one came all the way back in February, in a hotel suite in Indianapolis. The Texans coach was just getting his 15-minute combine interview with the two-time Heisman finalist going, and wanted detail on a run-pass option Clemson called on its first possession against Alabama in January. Little did either guy know, the wheels were turning on getting to where we are now, and what we’ve seen go down the past few weeks. Not as impressive as Watson’s been in his second and third starts, mind you. The rookie will take the 2-2 Texans into Sunday night’s showdown against the 4-0 Chiefs having thrown for 584 yards and six touchdowns on 47-of-67 (70.1 percent) passing—while effectively compartmentalizing three picks over that time—in his last 120 minutes of football. Deshaun Watson’s passer rating and completion percentage has ascended in each of his three starts. The Texans have gone 2-1 in that stretch, with the lone loss coming in the final seconds in New England. But for March, it was impressive nonetheless, and it explains why O’Brien didn’t just have some light bulb flicker over his head this summer. He knew from the time the team drafted him that he’d be able to play Watson if he needed. It’s certainly paying off now. In this week’s Game Plan, we’re going to examine whether the Stephon Gilmore signing has gone bust in New England; look at the resurgence of the Bills team he left; kick the tires one more time before Mitch Trubisky gets his first start Monday; and quickly check on the 2018 veteran quarterback market. We’ll start with the Texans and how O’Brien came to the point where he’d feel comfortable tossing a rookie the keys to a playoff-tested roster—an element of all this that’s important, because a reigning division champion can’t afford to have a young quarterback fall on his face the way a rebuilding team can. As I talked with O’Brien (we did something similar in May with GM Rick Smith, on how Houston was sold on the quarterback), we were able to outline a number of checkpoints over the course of this calendar year that led to the coach handing the reins to Watson at halftime of the opener. Again, that all started in that Indy hotel suite, and we’ll jump from there ahead to his visit to the team’s facility just ahead of the draft. • April 18: A couple weeks back, as you probably know by now, Watson gave his first game check to three cafeteria workers who were affected by Hurricane Harvey. That came as a surprise to no one in the building, and it was from the start that O’Brien saw a young player capable of leading older guys. • May 1: Watson went home after his introductory press conference with what O’Brien and the Texans call the “basic information section,” which is the foundation of learning on which rookies will build. It runs through the team’s personnel groupings, formations, motions, and calls. • May/June: Learning is one thing. Translating it to the field is another. And so after rookie minicamp, the work for Watson was on taking the mental pieces of the game and being able to implement them with veterans all around him. In the time between that first camp and the start of OTAs, he did that. • Late June/Early July: The Texans finished their mid-June minicamp and, along with the rest of league, broke for summer. Only Watson didn’t really take much of a break. “I texted him a lot, different questions, whether it was a protection, or a route, or something that had to do with read of a route vs. a certain coverage,” said O’Brien. “I don’t think I texted him every day, but I texted him quite a bit. And it was pretty interesting to me, because it wasn’t ever long until I got an answer. Sometimes, it was, Hey, can you clarify that question, are you talking about this or that? “And it was like, ‘Wow, this guy, he’s on the money with what he’s thinking.’ Sometimes when a guy asks you to clarify a question, you can tell that they really understand what you’re talking about.” That knowledge made Watson more viable going into camp. • Training camp: The Texans’ camp rotations allowed Watson to get reps with plenty of first-teamers, or at least the ones who were healthy. DeAndre Hopkins missed time with a thumb injury, Will Fuller broke his collarbone, and Duane Brown held out. As a result, for Watson, the key was actually what he did without those guys. • September 11: So by Week 1, it’s fair to say Watson’s growing body of work added up to the leash for Savage being pulled to an arm’s length. Savage could not afford to stumble much. And then the Jags held the Texans to 52 yards in the first half of the opener. O’Brien also lauded how Watson tries to involve his teammates on each play in practice. He may pitch the ball on an option even if he doesn’t have to, just to make sure the back knows he’s needed. The coach points to back-shoulder touchdown throws to Ryan Griffin in New England and Fuller against Tennessee as a result of Watson keeping guys after practice to work on timing. 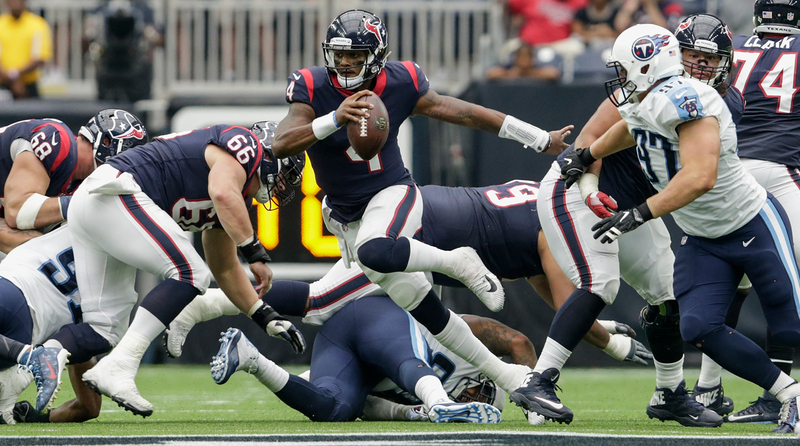 Watson’s also taken advantage of having his position coach, Sean Ryan, and his now-backup, Tom Savage, as resources in a way not all young players would. And through those sorts of things, O’Brien knows that while Watson has a ways to go as an NFL quarterback, he’s giving himself every chance to get there. As for whether this solves the Texans’ quarterback problem, which has hovered over O’Brien’s whole tenure, the fourth-year coach was coy. But it’s pretty clear that franchise is in a better spot than it has been. This week, the challenge is a little different, with a talented Chiefs defense and a creative coordinator, Bob Sutton, coming to Houston. Maybe this is where one of the inevitable bumps in Watson’s rookie year comes. And that’s OK. Whatever’s ahead, the Texans trust he’ll be able to handle it. 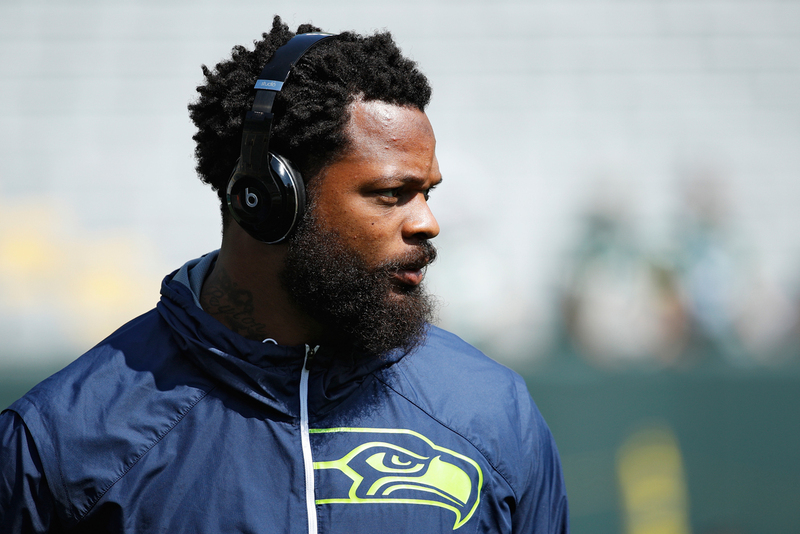 Las Vegas police said it found ‘no evidence’ of excessive force used on Seahawks defensive lineman Michael Bennett. 1. On the Michael Bennett case. I’m not here to tell you what happened on the night of the Mayweather/McGregor fight in Las Vegas. The video evidence presented by Las Vegas police shows Seahawks star Michael Bennett and the police being cordial with one another at the end of their encounter, and it shows why Bennett was seen as a person of interest (he hid, then fled as most others on the screen followed orders to hit the deck in what was believed to be an active shooter situation), and it shows a moment where the police were aggressive with him. There’s also a hole in the video where Bennett was actually taken to the ground, creating enough gray area there for anyone to make all of that say whatever he or she wants it to say. But do people really want more information before making a judgment? This case, like so many others, has become a talking point, one that has the flexibility to fit into a variety of narratives. If you want this to be another example of police brutality against an African-American, then it can be that. If you want this to be a professional athlete lying to make himself a martyr, then you can twist it that way as well. And what seems to be lost in this is that the accusations being heaved around are really heavy. The same way we should be careful before branding players as domestic abusers, we should show caution calling police racist or abusive, because those labels aren’t easily shed, particularly now as part of a very serious, hot-button issue. In the end, our job in the media is to get to the truth, not frame conversations for our own devices, which we’ve seen happen frequently on this story the past few days. If the police used excessive force on Bennett or racially profiled him, then they should be punished. But we should at the very least wait until we have conclusive evidence, one way or the other. For his part, Bennett’s lawyer John Burris told me Wednesday that he hasn’t seen video of the actual takedown, and is doubtful it even exists. Also, Burris was clear on this: “Michael said it was racial profiling, but I do not have to prove that. … It’s not part of my proof issues.” And I did reach out to Bennett, unsuccessfully. It will be interesting to see what Bennett says to the Seattle media later this week. 2. Buyers’ remorse for New England? The price tag alone made the Patriots’ signing of Stephon Gilmore seem massively out of character. Four weeks into the ex-Bill’s career, it looks even worse. Now it looks like that out-of-character, top-of-the-market expenditure may have been on a player who really doesn’t fit. Gilmore, to put it lightly, had a rough day at the office last Sunday. Twice late in the second quarter on Sunday, Gilmore and teammate Eric Rowe covered the same man, leaving another Panthers uncovered—first Kelvin Benjamin, who ran free for 43 yards; then Devin Funchess, who scored from 10 yards out. There was also a miscommunication on Panther fullback Fozzy Whitaker’s 28-yard touchdown, where Gilmore followed the motion man and vacated the area where Whitaker ran open. What’s really troubling here is that this isn’t necessarily new. Based on what I’d heard from three sources who were in Buffalo last season, Gilmore had grown a reputation in Buffalo for finger-pointing on plays like these. And as he dealt with a shoulder issue last year, Bills people noticed that he’d started to make what they believed to be business decisions on run plays. His quiet, reserved nature left those questions unanswered, and Buffalo knew coming out of last season that his price tag—based on his talent—would be too rich for its blood. And that’s why the people I talked to were stunned in March when Gilmore, who they viewed as a corner that was probably somewhere between the 11th and 15th best in football, was signed by the Patriots. It wasn’t so much the money as it was a weird match for a team that smartly signed Chris Hogan and Mike Gillislee away from the Bills. Now, Gilmore is talented, and it’s early, and maybe he grows through this. But the early signs seems to signal that some of the confusion out of Buffalo on how this signing came together was warranted. 3. Bills on the rebound. Over the four months between the draft and the start of the season, Bills GM Brandon Beane and coach Sean McDermott have drawn a line in the sand on discipline, as they try to straighten out what they believe had been a pretty loose operation. They traded Sammy Watkins and Ronald Darby, suspended Marcel Dareus for a preseason game, and have delivered the general message that they won’t hesitate to confront any sort of deviation from the plan. And now we’ve got some proof, in the team’s 3-1 start, that the new Bills brass has buy-in from the players. So how has McDermott done it? The moves to instill discipline have gotten the attention, but the first-year head coach has quietly done even more to create togetherness within the group. He’s grouped guys in the locker room by position to build camaraderie among the units, and I’m told that a couple times a week, he’ll start the day by having a player address the team with what motivates him or with a story of what he’s been through in his life. The idea is that it’ll show up late in games, when guys need to trust each other. It sure looked like it did in the massive upset of the Falcons in Atlanta. And it reminds me of a talk I had with McDermott a couple weeks ago, where he explained what he took from his six years as Ron Rivera’s defensive coordinator in Carolina that he’d apply in Buffalo. We’ll see if the Bills can sustain their early momentum in Cincinnati this week and throughout October. Long-term, though, these are good signs that the franchise is moving forward in lockstep, after years of being a bit disjointed. 4. Bearing down. It’s hard to predict the future of a quarterback before he’s started a game, so I’ll just say this: Don’t look at the failure of Mike Glennon in Chicago as any sort of sign that the Bears are rushing rookie Mitch Trubisky on to the field. Trubisky has passed every test the coaches have handed him, which is why, when Glennon stumbled, the decision to go to the second overall draft pick was academic. The timing just had to be right. It was this week, with an 11-day layoff between games, Glennon struggling, and a home date on tap. What I’ve liked, from the start, is the Bears’ conviction in a guy who started just 13 college games. It’s something that GM Ryan Pace explained really has developed over the past 12 months: “During the (2016) season, myself, some of our directors on the college end, obviously, we were studying all the quarterbacks all over the country. I did multiple games live on every top quarterback candidate. So I knew. Mitch was No. 1 for me, which I kept quiet. But then as information came in—our college director feels this way, our director of player personnel feels this way, our area scout feels this way, our over-the-top scout feels this way. That’s good. But we still had to go through the combine, the interview process, have our coaches look at the quarterbacks. So it didn’t start coming into clearer focus until our draft board was getting set. “And then, it was, ‘God, we’re picking in the Top 5, hopefully we’re not picking up here very often.’ And it became ‘what are your options gonna be in this area that we’re picking.’ Then, we realized, ‘man, we really like this guy.’ And then, ‘How do we pull it off?’” Truth is, Trubisky has continued to answer every one of those questions for the Bears. So now we get to see if all that faith was warranted. 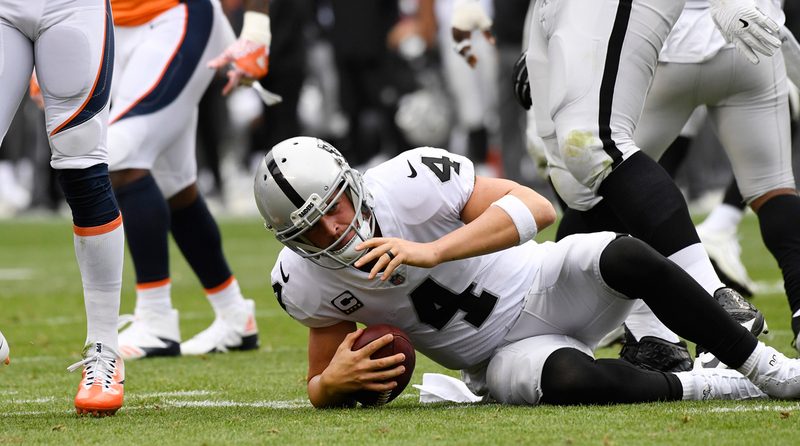 The Raiders don’t believe Derek Carr will be down long, judging by their lack of acquiring another quarterback following Carr’s injury. 1. Maybe it was just to keep the confidence of the rest of the team in a tough spot, but the Raiders didn’t really even think much about bringing in a stopgap quarterback in the wake of Derek Carr’s injury. I’m told the Raiders like what they’ve seen from EJ Manuel and Connor Cook. They are expecting Carr back soon, too. He tried to talk the team into giving him a shot this week, which was unrealistic but shows that he’s not very far off. 2. The Raiders have worked hard with Manuel on his lower-body mechanics, with the idea that would lead to improved accuracy from the pocket. It’s something the coaches were able to see as soon as he got into the lineup in Denver, and the hope is he can keep that going . 3. While we’re there, and we can include the Titans in this, the question of Colin Kaepernick’s unemployment keeps coming up, so I’ll point everyone to the work I did on this in the spring and at the beginning of the season. It’s pretty simple: In the minds of these teams, Kaepernick’s ability as a player doesn’t measure up to justify what would go along signing him. So he remains unsigned. 4. The Bucs secondary needs to be better than it has been and will go into Thursday night’s showdown with the Patriots under the microscope. In particular, they need more from 2016 first-round pick Vernon Hargreaves. 5. What a bizarre circumstance in Cleveland. If the Jets win, that could legitimately take them out of the running for the first pick for good. A win would put them three games ahead of the Browns in the overall standings and give them the tiebreaker to boot. 6. Andrew Luck didn’t just start throwing. Everything has been part of a carefully planned rollout. And making sure he takes his time and gets fully healthy prior to going in a real game will prove to be the right call for a transitioning franchise. 7. Very interesting to see Ben Roethlisberger call out Antonio Brown, a player the Steelers have defended in the past based on his reputation as a competitor. Roethliberger knows that a star of Brown’s magnitude has no choice on being a team leader. His incredible play means that younger players will emulate him. 8. Here’s a coaching name to watch: Matt LaFleur. He was Matt Ryan’s position coach for the QB’s MVP season last year, and this year has a hand in the renaissance of Jared Goff. Rams coach Sean McVay mentioned LaFleur as a key there, and LaFluer’s relationships with both McVay and Kyle Shanahan won’t hurt his advancement down the line, that’s for sure. 9. While the Ravens have been uneven the past couple weeks, it should be noted that linebacker C.J. Mosley has taken another step forward in 2017. And this is a player who’s already made two Pro Bowl teams. 10. These are valuable reps the Colts are getting Jacoby Brissett. When Andrew Luck gets back, Brissett will keep all that experience and is on the books for just under $1.7 million for the next two years. That is bargain basement for a backup quarterback. 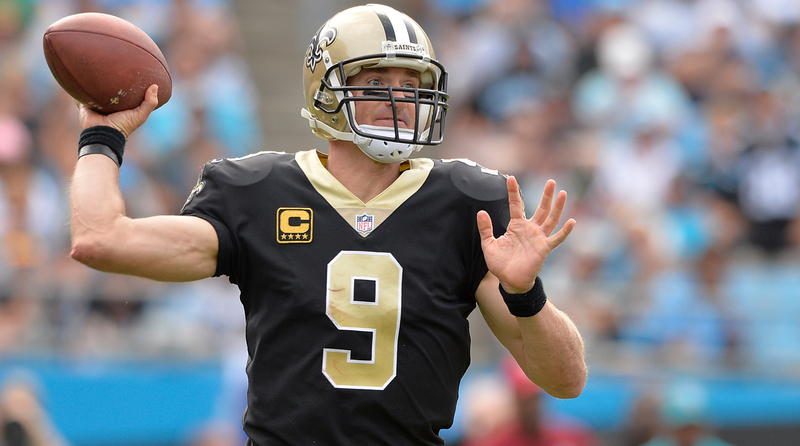 Drew Brees is one of several veteran quarterbacks who could be available after the 2017 season ends. Remember what we harped on over the summer? That rich 2018 veteran quarterback market is taking shape. And teams are taking notice. If your team needs a quarterback coming out of this year, your timing might not be so bad. Our lesson for the week: This could well be the closest supply will ever come to matching demand when it comes to that position in this era of the NFL. And for some teams, because of this bumper crop, going with a veteran may actually make more sense than hitching your wagon to a rookie. “Fans and media want their guy—the start-from-the-bottom, untainted rookie,” said one AFC exec. “And the Moneyball guys will say it’s cheaper through the draft, which is true. Bu if the point is to have a functional starting quarterback, any football guy will tell you that while everyone wants a Brady or Rodgers, the reality is those are fewer and father between. 1. Drew Brees turns 39 in January. That said, he’s been lights out through four games, and is on pace to post his best passer rating in six years, having lifted the Saints through a rough start. He’s also a free agent-to-be with a no-franchise-tag provision in his contract. And if there’s any kind of upheaval in the New Orleans brass after the season, it’s worth asking whether there’s a better place for him to chase another ring. He told me last summer he wants to play into his mid-40s. 2. Kirk Cousins was a little up and down in Week 1, but has been outstanding since, lighting up the Raiders in Week 3 and playing plenty good enough to beat the Chiefs in last Sunday night’s loss. Another franchise tag will cost the Skins more than $34 million for 2018, and they might be forced into a corner on that one. Also, this much seems clear: the 49ers, and noted Cousins enthusiast Kyle Shanahan, will be looking for a quarterback in March. 3. Jimmy Garoppolo isn’t playing, and was up and down in the preseason. Ideally, the Patriots would like him to eventually succeed Tom Brady. But so long as Brady wants to keep playing, this situation figures to get a little fiscally (a franchise tag would be worth about $7 million more than Brady is scheduled to make) and socially (see: Garoppolo’s desire to play) awkward in 2018. 4. Neither Sam Bradford nor Teddy Bridgewater is playing right now, and one of the two will almost certainly be in Minnesota as starter in 2018. The other? Well, that’s complicated by Bridgewater’s injury, and whether his contract would toll or not if he sits the whole year. But as it stands now, both are on expiring deals, and whoever isn’t the presumed starter for next year would probably look around. 5. Alex Smith has been off the charts, completing 76.0 (!) percent of his passes for 1,067 yards, eight touchdowns, zero interceptions and a 124.2 rating for the perfect Chiefs. But … he does have the 10th pick in the 2017 draft, Patrick Mahomes, sitting behind him. Based on Smith’s play, and his affordable contract, this could well turn into a mid-2000s Chargers situation—where Brees held off Philip Rivers for two years before bolting for New Orleans. Either way, it’s worth monitoring. 6. The Bengals have been reluctant to deal AJ McCarron because they like him. And his deal is up after this year, and others certainly have taken note of their trepidation to let him go. 7. Tyrod Taylor needs to be accounted for here. But based on how Buffalo’s playing, his $16 million number for 2018 looks like a bargain. 8. Flip side? Jay Cutler was pretty average through two games, then laid an egg against the Saints in London, which would seem to increase the chances he walks away for good after this year—and make Ryan Tannehill, turning 30 next summer, feel a little more secure. Add all this up, and to the aforementioned bumper crop of quarterbacks expected in next year’s draft, and it should be a fun March and April at the game’s most important spot.